Pope Francis on September 20, 2018, sent a video to the people of Lithuania, Latvia, and Estonia as he prepares for his September 22-25, 2018, apostolic journey to the three countries. On the eve of my visit to the Baltics, Lithuania, Latvia, and Estonia, I wish to send a warm word of greeting to all of you who live in those lands. Though I come as a pastor of the Catholic Church, I would like to embrace everyone and offer a message of peace, goodwill, and hope for the future. My visit coincides with the centenary of the independence of your Nations’ independence and will naturally honor all those whose past sacrifices have made your present freedom possible. Freedom, as we know, is a treasure that must be constantly preserved and handed down, as a precious legacy to new generations. 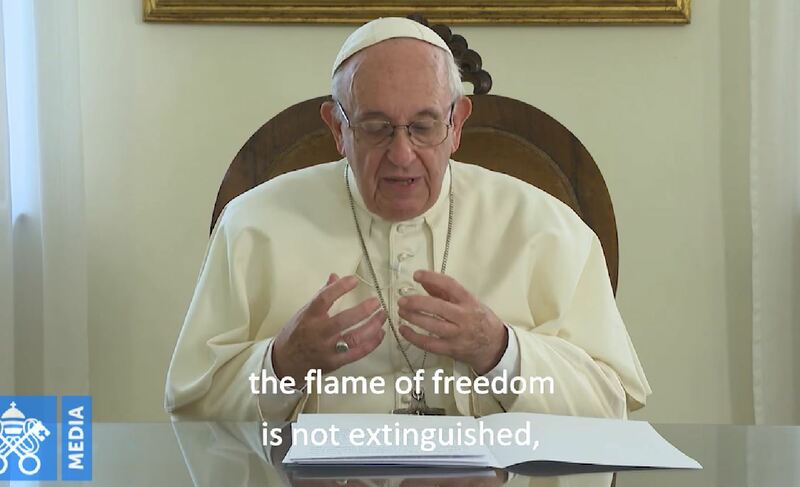 In times of darkness, violence and persecution, the flame of freedom is not extinguished but inspires the hope in a future where every person’s God-given dignity is respected and each one of us feels called to collaborate towards building a just and fraternal society. Today that sense of solidarity and service for the common good is more than ever. I hope that my visit will be a source of encouragement for all those people of good will who, inspired by the deepest spiritual and cultural values inherited from the past, are working peacefully to alleviate the suffering of our brothers and sisters in need and to promote unity and harmony at every level of society. I know that many people are working tirelessly to prepare for my visit and I thank them with all my heart. I assure you all of my closeness in prayer and send my blessing. And I ask you, please, pray for me. God bless you!